Results and reports from meets, gala's, etc are shown on this page. Please contact us if the information is not shown or if you have any feedback. 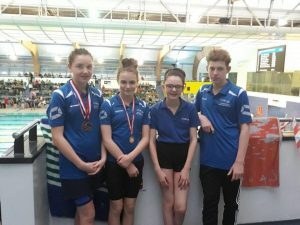 Wear Valley Amateur Swimming Club’s Senior squad enjoyed a very competitive Level 1 gala called the National Qualifier, held at Sunderland Aquatic Centre over the weekend of 22-24 March 2019. Teams from Manchester, Lincoln and Ellesmere College were in attendance together with many other more local teams including Newcastle and Sunderland. 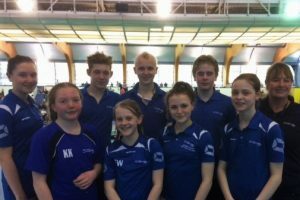 The Wear Valley squad were represented by 8 swimmers, all swimming results are recorded in Long Course (50m) times. Jessica Maughan gained long course personal bests (pbs) for each of her 3 events, which were the 100m and 200m breaststroke, and the 100m freestyle (free). Jessica took 7 seconds off her 100m free time to gain a new time of 1.08.84. James Holliday also gained pbs in both of his events taking 4 long course seconds off his previous 50m backstroke (back) time. Emily Whitton swam pbs in each of her 3 events; 50m and 100m free and 50m back. Ella Sowerby swam a long course pb in her 50m free event. Joseph Dobson swam 4 personal bests in the 50m, 100m and 200m breaststroke and 50m butterfly (fly). Joseph took 3 seconds off his previous 200 breaststroke; his new time is 2.51.11 seconds. Annabel Cooper swam 3 long course personal bests in the 800m free and the 200m and 400m Individual Medleys. Annabel gained 6-second-long course pbs in both of the longer distance events. Nic Cooper swam a pb in his 50m free and Thomas Power swam 5 pbs in the 50m and 100m free, 50m and 100m breaststroke and 50m fly. Thomas took 4 seconds off his previous 100m breaststroke time with a new time of 1.22.28. A fabulous weekend of swimming against a very good competitive field. Many thanks to the Coaches and parents for their fantastic support and encouragement. 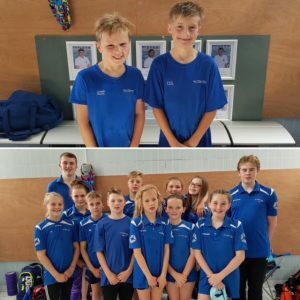 A total of 20 Wear Valley swimmers from the “Dolphin” and “Junior” squads gained some fantastic results at a recent gala held at the Louisa Centre, Stanley over the weekend of 2/3 March 2019. 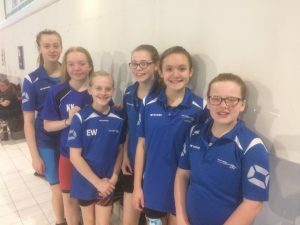 For 10 of these swimmers, it was their first inter-club competitive gala and they were delighted with their results when compared with their entry times. Some also gained their first medals with medals being awarded to the top 6 swimmers in each age group. Annemarie Kelley and Beatrice Forsyth both took over 10 seconds off their entry times in the 50m backstroke (back) and 50m breaststroke events. Charlotte Strugnell swam 8 seconds faster than her entry time for the 50m freestyle (free) and won a 5th place medal for this event. Holly Roe also swam 9 seconds faster in her 50m back and 4 seconds faster than her entry time in the 50m breaststroke. Isobel Micklethwait swam 8 seconds faster than her entry time in the 50m free. Logan Hunter competed in 4 events for the first time and won a 4th place in the 50m breaststroke. Lola Copeland came 5th in the 50m breaststroke. Lydia Quinn swam 3 events for the first time and finished 4th in the 50m back. Oliver Hunter won a gold medal in the 50m butterfly (fly) and this was the very first time that he has competed in this event! He also gained a 4th place in the 50m free. Roberta Antonescu gained a 6th place in the 50m back. Adam Readman gained two 5th place medals in the 100m and 200m free, together with a 10 second personal best (pb) in the 200m free. Ella Sowerby won a silver medal in the 100m fly and came 4th in the 50m back. Ethan Flint swam pbs in both of his 50m and 100m free events. Joseph Brown won a bronze medal in the 100m breaststroke and was placed 6th in the 50m fly, 50m and 100m back. Katie Brooks-Shea swam the 100m back for the first time in a competitive gala and swam 10 seconds faster than her entry time. Lauren Flint swam a total of 8 events, gained 3 pbs in events she has swam previously and was considerably faster than her entry times for her 5 other events. Lauren also came 4th in the 200m back and 200m breaststroke which were “first time” swims. Maia Humphreys gained a 3 second pb in the 50m free. Mia Featherstone also swam a 2 second pb in the 100m free. Nicole Walker competed in 8 events and gained an 8 second pb in the 100m Individual Medley, a bronze medal in the 200m back and a 6th place in the 100m back. Owen Potter swam in 6 events and gained some massive pbs, including 9 seconds off his 100m free and 6 seconds off the 100m breaststroke. Owen also won a 5th place in this event. This was a fantastic swimming gala for all of the debutants and young swimmers. Most of the athletes swam faster than their entry times and/or gained pbs and some even won some medals for the first time! Overall a very impressive first-time gala. Many thanks to the coaches and parents for their continued support and encouragement. Thomas Power, Neve Mason and Ryan Baker have also swum County times but were too old to compete in these championships. This gala was held in a 50-metre pool so all times swam were long course (50 metre) times. Jessica Maughan swam in the 100m and 200m breaststroke events and gained long course personal bests (pbs) in both events. Well done Jessica! Annabel Cooper competed in the 50m and 100m butterfly (fly), together with the 100m and 400m freestyle on the first weekend. Annabel was delighted with a pb in each of these events and won a silver medal in the 400m free with a new pb of 4.51.06. On the second weekend, Annabel competed in the 200m and 800m free, 400m Individual Medley and the 200m fly. Annabel gained long course pbs in the 200m free, 400m IM and 200m fly, together with a bronze medal in the 200m fly. Very well done to both of our “Age group” swimmers and many thanks to the Coaches. 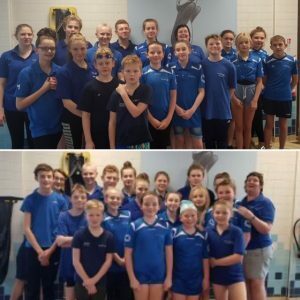 Wear Valley Amateur Swimming Club swimmers were in action again at their first gala of the year, gaining fabulous times and earning a host of medals. The gala was held by Peterlee and Derwentside Swimming clubs at the Louisa Centre, Stanley over the weekend of 12th/13th January. A total of 15 swimmers from the club competed. Three athletes (Kieran Baker, Mia Featherstone and Owen Potter) from the Junior squad, swam their first competitive gala. Kieran Baker competed in the 50m freestyle (free) and 100m breaststroke, taking 27 seconds off his entry time for this event. Mia Featherstone swam 3 events and narrowly missed out on a medal finishing 4th in the 50m breaststroke. Owen Potter swam 4 events for the first time, notably taking 18 seconds off his entry time for the 100m breaststroke. Oliver Sommerville gained personal bests (pbs) in the 50m breaststroke and the 50m free. Nicole Walker swam pbs in each of her events, taking 10 seconds off her 50m breaststroke time. Lauren Flint also gained 4 pbs and took 4 seconds off her 50m backstroke (back). Katie Brooks-Shea achieved 3 pbs and took 6 seconds off her 50m breaststroke time. Ella Sowerby swam a pb in her 50m fly. Together with pbs, medals were also won in the Senior squad. Ryan Baker won gold in the 100m breaststroke and 50m butterfly (fly), together with a bronze in the 50m free. Thomas Power won a gold in the 50m breaststroke and swam a pb in the 100m backstroke (back). Joseph Dobson won gold medals in the 200m Individual Medley (IM), 50m breaststroke, silver medals in the 50, 100 and 200m free. Joseph also took 2 seconds off his previous 200m free time and gained pbs in the 100m free and 200m IM. James Holliday swam pbs in 7 out of 8 of his events and took 4 seconds off his 200m IM. Emily Whitton also gained 7 pbs out of her 8 events. Emily took 9 seconds off her 200m breaststroke time. Nic Cooper won a medal in each of his events, gold in the 50m free, silvers in the 200m IM,200m breaststroke, 50 and 100m back and a bronze in the 200m free. He also gained a pb in the 50m back. Annabel Cooper won gold in the 100 and 200m free and the 200m IM (also a pb), silvers in the 50 and 200m back and 50m free. A fabulous start to the year for the Wear Valley swimmers! A couple of Juniors from Wear Valley Amateur Swimming Club together with five Seniors recently competed in the Middlesbrough Christmas Gala held at the Neptune Centre, Middlesbrough on Sunday 9th December 2018. Nicole Walker won a silver medal in the 100 metres freestyle (free) and this was the first time that she has ever competed at this distance. Nicole also won a bronze medal in the 50m breaststroke, taking 7 seconds off her previous personal best (pb). She also narrowly missed out on a medal, coming 4th in the 50m backstroke. Adam Readman, also a Junior, swam pbs in the 50 metre butterfly (fly), taking 9 seconds off his previous pb, gained a 3 second pb in the 200m free and swam the 100m breaststroke for the first time. In the Seniors, Thomas Power won a silver medal in the 100m breaststroke, taking 2 seconds off his previous time. Emily Whitton swam pbs in both the 50m breaststroke and 100m fly. James Holliday also gained 2 pbs in the 50 m free and 100m breaststroke. Annabel Cooper won a bronze medal in the 100m free and swam a pb in the 100m Individual Medley (IM). Nicholas Cooper took 4 seconds off his 200m IM. The medal winners were delighted with their Santa medals and the personal bests were well earned. The gala was enjoyed by all of the swimmers and many thanks to the coaching staff. Wear Valley Amateur Swimming Club (WVASC) swimmers were very excited to witness a World Downs Junior Record set in the 100m Individual Medley (IM) by visiting swimmer Harvey Stonebank (14) from Richmond Dales swimming club. Harvey also swam European Junior Downs Records in the 200m freestyle (free) and in the 100m butterfly (fly) very many congratulations Harvey! At the same Wear Valley Gala, a fantastic total of 15 gold, 15 silver and 11 bronze medals, together with 42 personal bests (pbs) were won by WVASC swimmers. The gala took place at Woodhouse Close Leisure Centre, Bishop Auckland over the weekend of 10/11th November. Visiting clubs included Richmond Dales, Middlesbrough, Hetton, Sedgefield, Stokesley, Darlington, Derwentside, Tynedale, Bedale and Sunderland. During the gala the two minutes silence was observed by all swimmers, staff, coaches, officials and spectators. From the Junior squad, Katie Brooks-Shea swam a pb in each of her 3 events and took 4 seconds off her 50m backstroke (back). Lauren Flint also gained 3 pbs and a 2 second pb in the 100m free. Adam Readman took 6 seconds off the 100m IM winning a bronze medal. Lily Mulholland achieved 2 pbs including a 2 second pb in the 50m back. Nicole Walker swam a 5 second pb in the 50m back. Reece Cunnachie had a fantastic gala gaining a pb in every event swam. Reece took 4 seconds off his 100m free. Sophie Liddell gained a pb in the 50m butterfly and a bronze medal in the 50m free. Lucy Randall also swam a pb in the 50m fly, won a gold in this event and a bronze medal in the 50m free. Ella Sowerby took 5 seconds off her 100 IM time and also gained pbs in the 50m back and 50m fly. James Holliday took 13 seconds off the 200m back and won a bronze medal. James also swam pbs in the 200m free and 100m breaststroke. Joseph Brown just missed out on a medal in the 50m fly, coming 4th and swam the 100m free for the first time. Ethan Flint swam a good 50m free and Amy Frame took 5 seconds off her 50m back. The Senior Squad also gained lots of pbs and medals. Emily Power had two fabulous swims taking 19 seconds off her 50m free and 5 seconds off the 50 breaststroke times. Emily Whitton took 11 seconds off her 100m breaststroke, 5 seconds off her 100m free and swam a fantastic first 400m free, taking 52 seconds off her fastest training time. Joseph Dobson achieved an 11 second pb in the 400 IM and won a gold medal in this event. Joseph also won 2 other gold, 2 silver and 3 bronze medals. Jessica Maughan swam the 400 IM for the first time and won a silver medal in this event, together with another silver and bronze medal. Thomas Power took 49 seconds off his 400m free and 14 seconds off the 200m free. He also won 2 gold and 3 silver medals. Nic Cooper took 2 seconds off the 100m fly and won 3 silver and 3 bronze medals. Annabel Cooper took 3 seconds off the 100m breaststroke and won 4 gold, 3 silver and 1 bronze medal. A great gala, thank you to the volunteers, officials, coaches, swimmers, Committee, spectators, WHCLC staff, Papa Kel’s (snack van) and NESS swimwear for a very memorable event. The North East Regional Short Course (25m) swimming gala was held at Pond’s Forge, Sheffield over the weekend of 3rd/4th November 2018. A total of six swimmers from Wear Valley Amateur Swimming Club qualified and every athlete achieved at least one personal best (pb). The competition was between swimmers representing teams including Sheffield, Leeds and Hull, to name a few. Our swimmers swam extremely well competing against some of the fastest swimmers (in their age group) in the country. It was a wonderful return to form for Neve Mason who achieved a pb in the 100m breast stroke in a time of 01.21.51. Jessica Maughan also continued to take time off her 200m breast stroke with a new time of 02.57.85. Joseph Dobson achieved pbs in the 50 and 100m breast stroke. Ryan Baker and Thomas Power swam pbs in the 50m breast stroke. Annabel Cooper was very pleased to take 5 seconds off her 400m Individual Medley with a new time of 05.33.96. All six athletes swam extremely well and many thanks to all of the Coaches. Five swimmers from the Senior Squad at Wear Valley Amateur Swimming Club swam a fantastic Level 2 gala at the Neptune Centre, Middlesbrough, over the weekend of the 20/21st October 2018. The squad swam some fabulous personal bests (pbs) and all gained at least one of the wonderful Halloween medals. Other teams competing included Aer Lingus from Dublin, Sunderland, Derwentside, Billingham, Darlington, Loftus, Stokesley and Middlesbrough. Thomas Power won second place in the 100m and 200m breaststroke with pbs in both of these events and a 6 second pb in the 200m breaststroke, together with a new time of 2.57.65. Thomas also gained pbs in the 50m freestyle (free), 200m backstroke (back) and 50m breaststroke. Joseph Dobson won 2 bronze medals in the 50m breaststroke and the 200m Individual Medley (IM). Joseph also gained 3 pbs in the 100m breaststroke, 200m IM and a 2 second pb in the 200m breaststroke with a new time of 2.48.93. Jessica Maughan, who recently gained her first swimming Regional time in the 200m breaststroke at a gala run by BOSSS continued to show sparkling form with a bronze medal in the 100m breaststroke, a 3 second pb in this event and a pb in the 50m free with a new time of 31.26. Nic Cooper was delighted with his silver medal in the 100m IM and a bronze in the 200m IM. Nic also achieved 4 pbs in the 100m breaststroke, 100m free and 100m and 200m IM. Annabel Cooper also swam some fabulous races gaining a 11 second pb and a gold medal in the 800m free with a new time of 9.47.74. She was also very pleased with a gold medal in the 400m free, silver in the 100m free and a bronze together with a pb in the 200m breaststroke. Many thanks to Middlesbrough ASC for a great gala and to WVASC Coaching staff. Wear Valley Amateur Swimming Club had a great start to the new swimming season with some fantastic personal bests (pbs) and medals won in the Billingham ASC Autumn Meet held on 22/23rd September 2018. Jessica Maughan swam pbs in each of her 5 events. Highlights included a 6 second pb in her 200m breaststroke, with a new time of 3.02.61 and a 2 second pb in the 50m back. Emily Whitton also swam lots of great pbs, gaining 7 out of 8 possible pbs. Emily took 7 seconds off her 200m breaststroke and 5 seconds off the 200m freestyle (free) with a new time of 2.35.58. Two gold medals and 2 silver medals were won by Ryan Baker in the 50 and 100m butterfly (fly) and in the 50m free and 100m breaststroke. Annabel Cooper was delighted with her gold medal in the 200m free with a new time of 2.16.51. Thomas Power gained 6 out of 8 possible pbs with a notable performance in the 200m Individual Medley (IM) gaining a 10 second pb and a new time of 2.42.72, together with a 3 second pb in the 100m free. Lauren Flint swam 3 out of a possible 4 pbs in the 50m and 100m free and in the 50m backstroke (back). Notably, Lauren gained a 4 second pb in the 50m back with a new time of 50.36. Ethan Flint also gained 3 pbs including a 6 second pb in the 50m back with a new time of 46.38 seconds. Joseph Brown also swam 3 pbs in the 50m breaststroke, 50m fly and 50m free. Joseph took 3 seconds off his 50m breaststroke time with a new time of 55.95. James Holliday swam pbs in the 200m IM and 100m back. Oliver Sommerville gained a 2 second pb in the 50m free with a new time of 44.67. Ella Sowerby gained a pb in the 50m free and Lucy Randall had a good swim in the 50m free. Nicholas Cooper gained pbs in the 50m back, 50m free and 50m fly. Adam Readman had some great first competitive swims in the 50m breaststroke, 100m free and 50m fly. Katie Brooks-Shea also swam very well in her first 100m free. Many thanks to all of the coaches to enable the swimmers to achieve these fabulous results and let’s hope for a fabulous swimming year! Madison Peveller (12) achieved an incredible 11th place in the 200m backstroke, at the Swim England National Summer Meet held at Pond’s Forge, Sheffield from 31st July-4th August 2018. 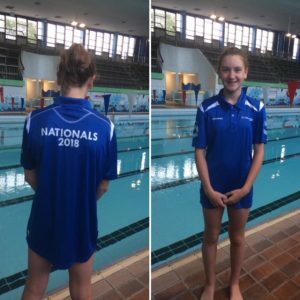 Everyone at Wear Valley Amateur Swimming Club is extremely proud of Madison’s achievements in both gaining a place in the National Championships and also going into the competition ranked 17th and finishing 11th with a time of 2.31.64. The competition was fierce but Madison held her nerve in what was her first (of hopefully many) National Championships. Wear Valley Amateur Swimming Club was in action again at the Gateshead and Whickham Summer Meet held at Dunston Leisure Centre on the weekend of 13th to 15th July 2018. A total of 17 other North East swimming clubs were also competing. Wear Valley sent a squad of 13 swimmers and over the weekend, 7 gold medals, 3 silver and 2 bronze medals were won, 28 short course Personal Bests (PBs) gained and Wear Valley swam in 8 finals. James Holliday swam six Personal Bests and won a gold in the 200m breaststroke, a bronze in the 200m Individual Medley (IM) and swam in the 50m breaststroke final. Emily Whitton swam 3 PBs in the 50m and 100m butterfly (Fly) and in the 50m backstroke. Sophie Liddell gained 4 PBs in the 50m freestyle, 50m breaststroke, 50m backstroke and swam a 7 second PB in the 100m freestyle. Ryan Baker swam in 2 events and gained places in the finals for both events. Ryan won a silver medal in the 50m freestyle and a bronze medal together with a PB in the 50m fly. Lauren Flint was delighted with her 2 PBs in the 50m freestyle and 50m backstroke. Lily Mulholland gained a PB in the 50m breaststroke. Lucy Randall won medals together with PBs in both of her events. Lucy won a gold medal in the 50m freestyle and a silver in the 200m freestyle gaining a 13 second PB in this event. Jessica Maughan swam one event and won a gold in this event, the 50m fly gaining a 2 second PB in the final. Ella Sowerby swam PBs in the 100m backstroke and in the 200m freestyle. Oliver Sommerville had an excellent race in the 50m free and gained a 3 second PB. Madison Peveller continued her winning streak with 2 gold medals and PBs in both the 50m and 200m backstroke. Annabel Cooper won a silver medal in the 100m fly and a PB in the 50m breaststroke. Nic Cooper won 2 gold medals in the 200m breaststroke and 200 backstroke. Nic also gained a PB in the 200 backstroke and in the 50m breaststroke. The gala had a great atmosphere and there were some fabulous swims by the Wear Valley team. 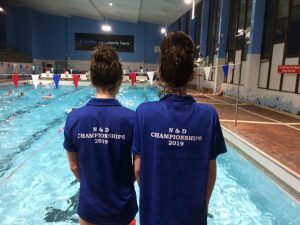 A total of 14 swimmers from the Dolphin, Junior and Senior squads of Wear Valley Amateur Swimming Club competed in the 9th Annual Derwentside Charity Gala. All money raised has been donated to the Cystic Fibrosis Society and the Paediatric Intensive Care Unit and Ward 9 at the RVI Hospital Newcastle. The gala was held at the Louisa Centre, Stanley in their 25m. pool over the weekend of 9/10th June. All personal bests (pbs) recorded are for short course (25m) times. Nicole Walker and Oliver Sommerville had several very good first swims. This was their first gala. James Holliday achieved pbs in each of his 7 events and Reece Cunnachie 4 pbs, taking 5 seconds off his 100m back with a new time of 1.36.20. Lauren and Ethan Flint achieved pbs in each of their 3 events, Ethan took 4 seconds off his 50m butterfly with a new time of 45.26 seconds. Ella Sowerby achieved 3 pbs with a 4 second pb in her 100m freestyle. Emily Whitton gained 3 pbs and Joseph Brown 2 pbs including a 13 second pb in the 100m Individual Medley (IM) with a new time of 1.48.46. Lily Mulholland also swam the 100 IM for the first time. Lucy Randall achieved 4 pbs. Annabel Cooper achieved 3 pbs, a gold medal in the 100m back and silvers in the 200m breast-stroke and 200m back. Ryan Baker reached 2 finals in the 50m breaststroke and 50m fly, winning a silver medal in the 50m breaststroke. Thomas Power achieved pbs in each of his events, gold medals in the 50m and 200m breaststroke and a silver medal in the 100m breaststroke. Well done to all of the swimmers especially the debutants. Many congratulations to Madison Peveller who has secured a place in the 2018 Swim England National Championships to be held in July/August. This is an incredible achievement as only very few swimmers qualify for these championships. Madison had a fantastic gala, swimming a time in the 200m backstroke which was ranked fast enough to be invited to swim in this national event. Madison won a bronze medal in this event achieving a personal best time of 2.30.20 in the final. Together with this, Madison also reached 3 other finals in the 100m backstroke, 50m freestyle and 50m backstroke. 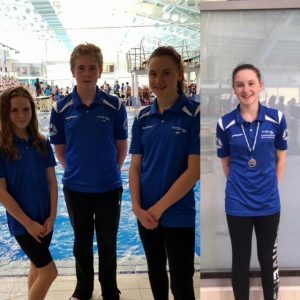 Two other swimmers, Thomas Power and Annabel Cooper also took part in these North East Regional Age Group Championships held at the John Charles Centre for Sport in Leeds over the weekends of 19/20th and 26/27th May. Thomas raced in the 50m breaststroke and Annabel achieved pbs in the 400m and 800m freestyle and 200m and 400m Individual Medleys. A fantastic gala for all 3 swimmers. Wear Valley Amateur Swimming Club is only a small swimming club when compared with other clubs in the Region but now has a National swimmer. The Wear Valley Amateur Swimming Club May Level 3 Meet welcomed 8 new competitive swimmers from our club. The gala, held on 12/13 May 2018, at Woodhouse Close Leisure Centre in Bishop Auckland saw our team of 22 swimmers from Wear Valley compete against 15 other teams including Middlesbrough, Newcastle and Sunderland. Highlights include a total of 34 medals, plenty of personal bests (pb) and fantastic first swims enjoyed by the new competitive swimmers. The debutants were Katie Brooks-Shea, who swam in the 50m free and 50m back, Joseph Brown who came 9th in his age category for the 50m breastroke. Ethan Flint swam the 50m free and 50m butterfly for the first time. Lauren Flint competed in the 50m free, 50m back and 50m breastroke. Amy Frame swam in the 50m free and 50m back races. Lily Mulholland also took part in these events as did Adam Readman. Jessica Swainsby was delighted to come 6th in her 50m breastroke event. Coaches Jo Barber, Angela Callan, Susan Rodgers, Catriona Grime, Megan Baker and Linda Rolfe were especially delighted with the youngsters first competitive swims. From the Junior Squad, Mason Bartlett won a bronze medal in the 100m backstroke, Reece Cunnachie took 15 seconds off his 200m free pb. James Holliday also gained a pb in this event and a 6th in the 100m breastroke. Sophie Liddell won bronze medals in both the 50m and 200m breastroke. Lucy Randall was very pleased with her bronze in the 50m butterfly and narrowly missed out on medals in the 50m back and 50m free. Ella Sowerby swam a 3 second pb in her 50m fly and Emily Whitton a 2 second pb in the 100m Individual Medley (IM). In the Senior Squad, Neve Mason swam pbs in each of her 4 events, gained 2 Regional times in these races and won 3 gold and 1 silver medals. Madison Peveller was delighted with her 5 gold, 2 silver medals and 9 second pb in the 100m IM. Thomas Power won a gold in the 200m IM and 2 bronze medals. Jessica Maughan was very pleased with her silver medals in the 100m and 200m IM. Joseph Dobson won 4 silver and 1 bronze medals. Nic Cooper was delighted with his silver medal in the 100m breastroke. Annabel Cooper won 3 gold, 3 silver and 1 bronze medals. Very well done to all of the Wear Valley swimmers! A set of fantastic results were achieved by seven swimmers from the junior and senior squads of Wear Valley Amateur Swimming Club who recently competed at the Richmond Dales April Fool Gala. The gala was held in Leeds at the John Charles Aquatic Centre in a 50m pool on the 28/29 April 2018. Some of the athletes competed in events for the first time and were very pleased with their times. The swimmers also had a wonderful time staying overnight in a hotel with their parents and enjoyed their Saturday night meal together. Ella Sowerby achieved 5 pbs which included taking 4 seconds off her 200m free with a new time of 3.11.19. James Holliday swam four new events; 50m and 200m freestyle, 50m back and 200m breaststroke. James came 5th in this event with a time of 3.36.08 and achieved 2 personal bests (pbs) in the 100m breaststroke and 100m back. Emily Whitton was delighted with her 4 new pbs, highlights included taking 9 seconds off her 200m free with a new time of 2.43.03. Mason Bartlett attained 3 pbs and 2 very good first time swims in the 200m Individual Medley (IM) and 100m breaststroke. Sophie Liddell also gained 2 pbs and had an excellent first competitive swim in the 50m fly with a time of 47.55. Thomas Power won a silver medal in the 50m breaststroke and a bronze in the 100m back, together with 2 pbs in the 200m free and 100m breaststroke. Thomas knocked 12 seconds off his previous 200m free with a new time of 2.37.45. Annabel Cooper competed in the 800m free for the first time and achieved a time of 10.08.77, together with a silver medal for this event and a qualifying time for the North East Regional Championships next month. She also won a bronze medal in the 100m breaststroke, silvers in the 50m free and 200m fly and a gold in the 400m free. A fantastic weekend and set of results for the young Wear Valley swimmers. Some fantastic results were achieved by the young swimmers at Wear Valley Amateur Swimming Club. 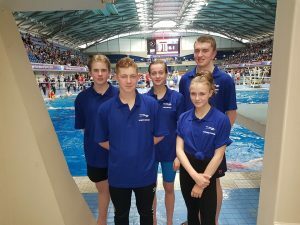 Ten swimmers competed at the “National Qualifier” held at Sunderland Aquatic Centre on the weekend of 23-25th March 2018. The standard of swimming was extremely high with our ten swimmers competing against other clubs from Manchester, Ellesmere College and Wigan, together with more local clubs including Newcastle. The gala was held in a 50m. pool and it was Lucy Randall’s first-time swimming events in a 50m. pool. Lucy achieved 3 personal bests (pbs) in her 50m free, 50m fly and 100m free, taking 3 seconds off her 100m free with a new time of 1.14.82. It was also James Holliday’s first competitive swim in a 50 m pool and James swam a pb in his only event the 50m breaststroke. He was delighted with his time of 45.65 seconds. Jessica Maughan also achieved 3 pbs in her 50m fly, 50m back and 200m breaststroke. For this latter event Jessica took 2 seconds off her previous pb attaining a time of 3.11.29. Thomas Power was very pleased with his 3 new pbs obtained in the 50m back, 50m breaststroke and 50m free. Thomas took 2 seconds off his 50m free with a new time of 31.62 seconds. Joseph Dobson also swam 3 pbs in his 100m free, 50m and 200m breaststroke. Joseph came 6th in his age group for the 50m breaststroke with a new time of 36.20 seconds. Katie Kerins swam 2 new pbs in the 50m free and 50m back. Emily Whitton was very pleased with her new pb in the 50m free. Nic. Cooper also swam 2 new pbs in the 50m and 100m freestyle. Madison Peveller came first in the 200m back and second in the 100m back. Annabel Cooper obtained a pb in the 50m fly and came third in the 400m Individual Medley. A fantastic set of results and a great experience of big competition for the young swimmers. 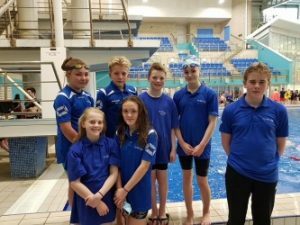 Eight Wear Valley Amateur Swimming Club swimmers achieved times to enable them to enter the County Championships held recently in the 50m pool in Sunderland. The championships took place over two weekends, 3rd/4th February and 9-11th February. It was medals galore for Madison Peveller (12) who won a gold in each of the three backstroke events. Madison was delighted with her gold medals and also won a silver medal in the 50m freestyle. Together with her medals, Madison achieved five new pb (Personal Best) times and competed in eight finals. Jessica Maughan (12) also achieved a pb in her 200m breaststroke with a new time of 3.12.68. Thomas Power (13) competed in his first County final in the 50m. breaststroke and was really pleased with his pb time of 36.73 seconds. It was Ellie Sowerby’s first County Championships and Ellie (10) competed in five events reaching the final in every event her age permitted her to. Ellie came 5th in the 100m breaststroke final with a new time of 1.36.66 and 9th in the 10/11 years 200m freestyle final. Ellie also came 4th in the 200m breaststroke, 8th in the 200m IM (Individual Medley) and 9th in the 200m freestyle. Ellie won a top ten position in each of her swim events. Ryan Baker (19) and Mason Bartlett (13) also competed in the 50m breaststroke. This was Mason’s first County Championship. Joseph Dobson (14) achieved 3 pbs in his 50m breaststroke, 200m breaststroke and 400m IM. He also finished 9th in the County for his 400m IM. Annabel Cooper (12) achieved four pbs in each of her freestyle events and was very pleased with her 4th in the 200m butterfly, 5th in the 200 and 400m freestyle and 6th in the 200m freestyle and 400m IM. Very many congratulations to all of the Wear Valley Amateur Swimming Club swimmers. 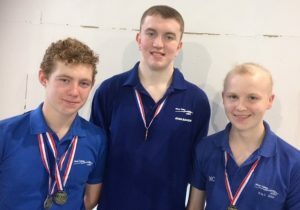 Four swimmers from the Wear Valley Amateur Swimming Club senior squad competed at the 50 metre Sunderland New Year Meet, held over the weekend of 13/14 January 2018. The standard of competition was very high with teams from as far afield as Edinburgh University, Orkney, Lincoln, Bradford and Ulverston amongst many others also competing. Joseph Dobson (14) achieved three Personal Bests (PBs). Joseph swam a PB of 29.27 seconds in his 50m free which he was delighted with. Jessica Maughan (12) gained a three second PB in her 50m breaststroke with a time of 42.74. Madison Peveller (12) won two bronze medals in the 50m back and 400m Individual Medley (IM). Madison also achieved a three second PB in her 50m breaststroke with a time of 42.05 seconds as well as a PB in her 50m butterfly. Annabel Cooper (12) was amazed with her gold medal in the 400 IM and also swam PBs in her 50m back and 50m butterfly. Well done to all swimmers. 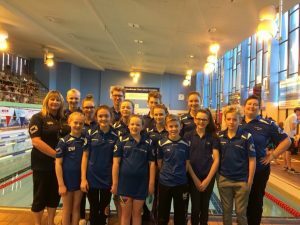 Wear Valley Amateur Swimming Club were in action again at the New Year Meet 2018 hosted by Peterlee and Derwentside Swimming Clubs on 6-7 January 2018. Some fantastic PBs (Personal Bests) were won together with medals. Huge congratulations to Neve Mason (15) who swam competitively for the first time in 2 years. Neve, who has undergone extensive back surgery won a bronze medal in the 50 back with a time of 34.08 and just missed out on a medal with a 4th place in the 100m back. Both swims were fantastic achievements for her after such a long absence from competitive swimming. Ellie Sowerby (10) continued her winning streak with 3 golds in the 200m Individual Medley (I.M. ), 200m free and 100m breast stroke. Ellie won 2 silvers in the 100m butterfly and 100m free and a bronze in the 200m back. Ellie was also delighted with 6 personal best times. Her greatest PB was swam in the 200m free where she took 10 seconds off with a resulting time of 2.42.88. Mason Bartlett (12) also swam PBs in the 100m and 200m free. Mason took 7 seconds off his 200m free with a time of 2:40.82. Lucy Randall (11) swam PBs in each of her 3 events the 100m free, 50m back and 50m fly. Lucy took 5 seconds off her 100m free with a time of 1.16.82. Katie Kerins (13) obtained 2 PBs in her 50 back and 100 free. Katie took 2 seconds off her 100m free. Sophie Liddell (10) won a silver in the 200m breaststroke and 2 PBs in her 50m back and 50m free. Emily Whitton (12) swam a PB in her 100m free. Our club gala was a fantastic event which showcased some fantastic swims from all of our squads. Take a look and see some of the great results. A massive thank you to all of our swimmers, spectators and volunteers who supported us! Over the weekend of 2-3 December 2017, 14 swimmers from Wear Valley Amateur Swimming Club (WVASC) competed in the Derwentside Christmas Cracker Meet held at the Louisa Centre, Stanley. The WVASC swimmers won a total of 6 gold, 6 silver and 5 bronze medals. Forty-seven personal best (pb) results were also achieved. From the senior squad, Madison Peveller (12) won a gold in the 12/13 year 100m fly, taking 6 seconds off her pb to win in a time of 1.14.27. Madison also won gold in the 12/13year 50m backstroke and secured a place in the open final, winning a silver in the same event. Joseph Dobson (14) won a silver medal in the 100m breaststroke taking 2 seconds off his pb to attain a time of 1.19.12. He was also rewarded with a place in the open 100m breaststroke final, winning another silver medal and swimming the exact same time again! Katie Kerins (13) had a fantastic gala achieving pbs in all four of her events; 50m free, 50m fly, 200m free and 200m Individual Medley (I.M.). Katie managed to take 12 seconds off her 200m freestyle pb to achieve a time of 2.32.66. Jessica Maughan (12) also swam very well in her 200m free taking 15 seconds off her pb. Charlotte Varley (13) was very pleased with her 200m fly result, gaining a bronze medal in the 12/13 year category and a 2 second pb. Nic Cooper (15) swam in 2 open finals, 100m breaststroke and 100m free, and took part in a thrilling swim off for a place in the open final of the 50m free, he lost by 00.01 of a second! Annabel Cooper (12) won a bronze in the 100m open fly final with a new pb of 1.13.92 and gold medals in the 12/13 year 200m free, 200m breaststroke and 200m fly. In the junior squad, Reece Cunnachie (12) was very pleased with a pb in the 50m free with a time of 37.91. Mason Bartlett (12) also achieved a pb in his 50m breaststroke and came 6th in the 200m backstroke, this was the first time that he had swam this event. Emily Whitton (12) secured 5 pbs, notably taking 12 seconds off her 200m free with a new time of 2.50.46 seconds. 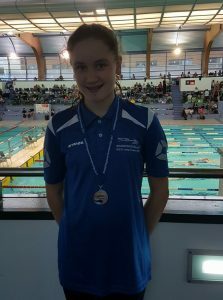 Sophie Liddell (10) won a silver medal in her age group for the 200m breaststroke with a pb of 3.42.62 and a bronze medal in the 100m breaststroke with another pb of 1.46.59. James Holliday (11) won a bronze medal in his age group for his very first 200m backstroke swim with a time of 3.18.93. Ella Sowerby (11) took 6 seconds off her 50m fly with a new time of 47.92 seconds. Lucy Randall (11) also achieved some fantastic times in events swam for the first time; 50m fly (38.86) and 100m backstroke (1.37.31), together with a 4 second pb in her 100m free. Well done swimmers and thank you to coaches! A total of 15 swimmers from Wear Valley Amateur Swimming Club (WVASC) competed in the Wear Valley November Level 3 Meet, held over the weekend of 11th and 12th November 2017 at Woodhouse Close Leisure Centre, Bishop Auckland. The Wear Valley swimmers competed against teams from Sedgefield, Derwentside, Stokesley, Hetton, Richmond Dale, AFS Hartlepool and Newcastle. WVASC achieved a total of 24 gold, 20 silver and 8 bronze medals. A fantastic total of 70 personal best swims were also gained. Swimmers from both the junior and senior squads competed in their individual age groups. From the junior squad there were 8 competitors. Lucy Randall (11) competed in her first level 3 gala and had some fantastic swims. She achieved a bronze in the 50m free with a time of 34.56 seconds. Ella Sowerby (11) gained personal bests (PB's) in all five of her events and came 9th in the 100m Individual Medley (IM). Ellie Sowerby (10) won gold medals in 6 of her 8 races and gained a silver in her 400m IM event. This was the first time that she had competed in this event. Ellie also took 5 seconds off her 100m breaststroke with a time of 1.35.69 and achieved 7 out of a possible 8 PB's. Emily Whitton (12) was delighted with her bronze medal in the 50m back taking off 4 seconds to obtain a time of 37.87. She also obtained 6 personal bests. Mason Bartlett (12) swam PB's in each of his 7 events and won silver medals in the 50m breaststroke and 100m IM. Mason took 10 seconds off the 200m free with a time of 2.47.95. Reece Cunnachie (12) obtained 2 PB's in his 50m fly and 100m back, together with a 6th place in the 50m back. James Holliday (11) achieved 3 PB's with a 5th place in the 50m breaststroke. Sophie Liddell (10) achieved a gold medal in the 50m breaststroke. Sophie swam the 200m breaststroke for the first time and achieved a silver medal with a time of 3.46.03. From the senior swimming squad, Charlotte Varley (13) obtained a gold in the 200m free and 3 silvers in the 200m fly, 200m IM and 200m breaststroke. Charlotte also took 28 seconds off her 400m free time to achieve a time of 5.03.08. Madison Peveller (12) achieved a medal in every event with 6 gold, 1 silver and 1 bronze. Madison took 18 seconds off her 400 IM time to achieve the gold in 5.32.09. Jessica Maughan also had a very good gala winning a gold in the 200m breaststroke and a silver in the 100m breaststroke. Joseph Dobson (14) won a gold in the 50m free with a time of 29.68 and silvers in the 100m fly and 400m IM, together with 2 bronzes in the 200m free and 100m breaststroke. Jack Dobson (17) won gold medals in the 50m fly and 400m free, a silver in the 100m IM and bronzes in the 50 and 100m free. Nicholas Cooper (16) won 4 golds and 3 silvers. He managed to take 5 seconds off his 100 IM time. Annabel Cooper (12) won golds in the 100m fly and 100m free, 5 silver and a bronze medal in the 100m breaststroke where she took 5 seconds off her PB. 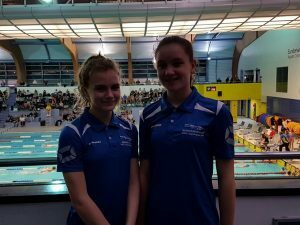 Many congratulations to Madison Peveller and Annabel Cooper who competed on behalf of Wear Valley Amateur Swimming Club in the North East Regional (NER) Age Group Championships. 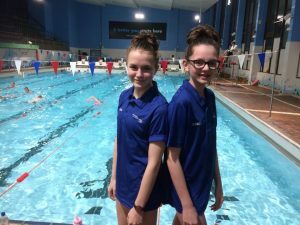 Madison and Annabel raced against other 12 year old girls in a total of 8 events each, held on the 28th and 29th October at the Sunderland Aquatic Centre. The competition was fierce as the region includes the swimming counties of Yorkshire, and Northumberland and Durham. Teams present included the City of Leeds, City of Sheffield and Newcastle Swim Team together with many other teams. Madison raced extremely well and obtained two medals. In the 100m backstroke, Madison won an NER silver medal taking three seconds off her personal best (PB) clocking a time of 1:09.36. Madison’s second medal was a bronze in the 50m backstroke, with a time of 32.85 seconds taking 1.5 seconds off her PB. Madison just missed out on a medal coming fourth in the 200m back with a time of 2.29.93 seconds. The 50m freestyle was swam by Madison in a sub 30 second time with a new PB of 29.59 seconds. Madison also achieved personal bests in her four other events which included 100m freestyle, 50m fly, 200m Individual Medley and 200m freestyle. Annabel Cooper was also very pleased with her results obtaining personal best times in seven out of eight events. She was delighted with her 5th place in the 400m freestyle, in a time of 4.50.07, 7th place in the 100m freestyle with a time of 1.03.83 and a ninth place in the 200m butterfly (2.48.83). Both girls would like to thank the coaching staff at Wear Valley, for all of the support they have received. Well done to all our swimmers who competed at the Chester lee street Gala on 25th April. The Gala was a very hectic event with the swimmers swimming up to 12 races, full results below. Well done to all the swimmers who took part un the above Gala, results and a full report can be found below. For full results please go th the N&D website, below you can find a club report. A big well done to all our swimmers who competed over the weekend of 10/11 Jan. Results and the gala report can now be viewed on the Gala Results tab. 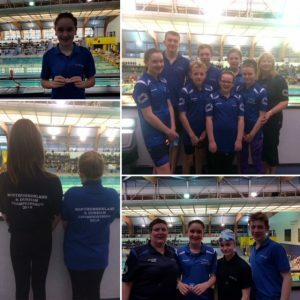 Weekend of the 6th and 7th Dec saw WVASC swimmers Nick Cooper and Neve Mason compete in the 2014 NER short course championships held at Sunderland Aquatic centre. Please go to the Gala results tab for a full report. Many congratulations to Neve Mason (12) and Nicholas Cooper (12) who swim in the Wear Valley Senior Squad for achieving times to enter the North East Region Championships (NER) held in Sunderland on the 6/7th December 2014. The two Wear Valley swimmers were in tough competition against swimmers from all over the North East Region including Leeds, Sheffield and Newcastle. Neve achieved 5 NER times to enter the Girls 10/13 100m breast, Girls 10/13 200m free, Girls 10/13 200m back, Girls 10/13 200m breast and Girls 10/13 100m back races. A delighted Neve took 3 seconds off her 200m breast, a second off her 100m breast and her 200m back was on personal best (pb). Well done Neve! Nic. achieved times to enable him to race in the Boys 10/14 200m breast and Boys 10/14 100m breast. He was very pleased taking 5 seconds off his 200m breast and 2 seconds off his 100m breast. A total of 4 pbs were achieved between the 2 swimmers. A great gala for both young swimmers and an amazing experience with over 400 swimmers present! Finally a big thank you to Angela and Faye for coaching Neve and Nic. at the NERs! A big well done to all our swimmers who competed over the weekend. Results and the gala report can now be viewed on the Gala Results tab.